A boiler is a pressure vessel that is designed to generate heat, produce steam or cool gases. Typically built as a rectangular or cylindrical tube, the vessel is closed at both ends and is fully insulated. Fuels such as wood, coal, oil, or natural gas power the device, making it possible for pressures of 30 bar and more to be created inside. In general, boilers are welded from thick steel plates with applications varying from hot water boilers to waste heat boilers and biomass boilers. heat energy to water, before transporting it to the desired area via a pipe system. The cooled water or the condensed steam then returns to the boiler to be heated again and flue gases are discharged into the atmosphere. Any loss of water must be compensated by treated fresh water in order to avoid corrosion. The Haycock boiler produced and stored large volumes of very low-pressure steam. In principle, they were based on a ‘steam-kettle’ design where a heat source (usually a fire) heats a partially filled water container from underneath. The heat transfer efficiency of these types of boilers was generally very low. This is the type of tube boiler that is commonly found in steam trains. It is partially filled with water and has a void above the water surface to accommodate the steam. The heat source powering the boiler is situated inside a firebox or furnace and it is important that this firebox kept immersed in water to maintain the temperature of the heating surface below boiling point. The fire tube boilers are classified as single tube and multi-tube boilers. A water-tube boiler circulates water through tubes that are exposed to the source of heat - as opposed to the more usual procedure of the tubes carrying hot gases through the water. They can be powered by different sources of heat and are often used in high-pressure steam applications as they’re able to withstand higher pressure. What issues can affect boilers? The operation of industrial boilers is energy intensive and issues can arise if they are not properly checked and cleaned on a regular basis. Deposits such as soot, ash and chemicals can begin to accumulate inside a boiler’s tubes within weeks, leading to health and safety issues during shutdown and maintenance. Burning waste or bio-fuels can produce sticky ash deposits which negatively impact a plant’s efficiency. Waste to energy plants face particular problems both in material handling and in the nature of ash that can deposit on heat exchange surfaces. As fuel costs have increased over the years, many wood processing and pharmaceutical plants now recover energy from waste materials. It is a convenient source of power with a low carbon footprint. However, boilers used for this often suffer from blockage due to the relatively high ash content of the fuel. The burning of fossil fuels releases different byproducts of combustion. If combustion is complete, carbon dioxide is produced. If incomplete, carbon monoxide is released and carbon is released as soot. Carbon monoxide is a poisonous gas and therefore boilers must be serviced regularly to ensure they do not produce it. Costly site downtime and expensive equipment failure are all results of an unmaintained boiler. However, the preventative nature of Primasonics Acoustic Cleaners can help to minimise equipment failure and reduce the amount of repairs needed. Boilers that suffer from any of the above problems can not be used to their full potential and are likely to decrease their lifespan. By installing acoustic cleaners in boilers, high thermal efficiency can be maintained for longer. Boilers must be cleaned and checked regularly do avoid issues which can affect production. How can boiler issues affect production? Problems within an industrial boiler can be a great inconvenience to a site of any size. 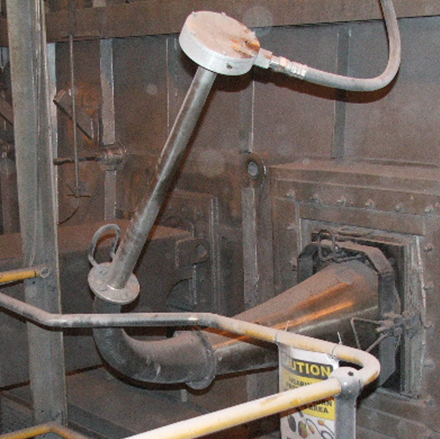 At worst, it can result in plant shutdown and costly repairs - leading to a loss of income. Even though water (or steam) as a heat carrier has many favourable properties, such as high energy absorption and easy transportability, it can sometimes make the process of determining when to clean a boiler quite complex. If left too late, and if an issue such as corrosion has occurred, the production levels of a site can be severely impacted. Regularly testing a boiler’s efficiency is the best way to understand how often cleaning is required. Another consideration should be the environmental conditions affecting your system and indications such as rising stack temperatures, dirty burners or improper firing ratios. Over the years boiler cleaning technology has made great strides in developing faster, easier and more efficient cleaning methods. As one of those methods, Acoustic Cleaning utilises very diffractive low frequency sound waves in order to reach much more of the boiler’s surface areas. This means that Acoustic Cleaners are able to clean all the heat exchange surfaces whilst maintaining thermal efficiency and differential pressure. The service uses existing openings to prevent a buildup of combustion material on heat exchange surfaces, meaning that no additional work needs to be carried out before the cleaning. Primasonics also offer a range of Acoustic Cleaners in a variety of materials (such as Inconel, hastelloy and even ceramic-coated models) to withstand chemical corrosion and high temperatures. The devices can be designed into the boilers to minimize the size of walkways required for retractable soot blowers and to offer all-round cleaning.